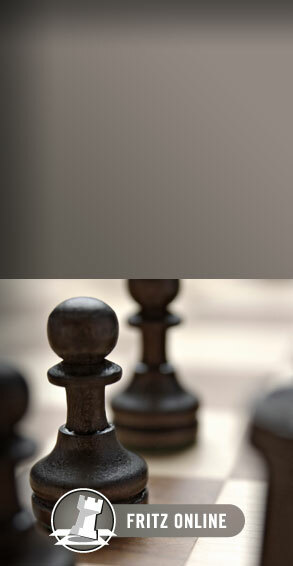 4/4/2014 – We reported extensively on the recently concluded Candidates Tournament, with summaries of all games, GM analysis and videos, and a large number of pictures. They were attributed to "the official web site", and a substantial number came from our regular, FIDE press officer WGM Anastasiya Karlovich. 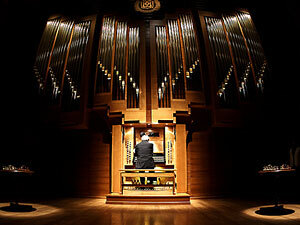 But there were many wonderful images by a talented new photographer, Kirill Merkuriev. 3/30/2014 – Two very hard fought games were played today to wrap the games up in Khanty-Mansiysk. 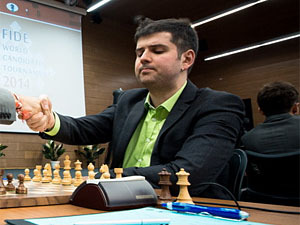 Topalov tried as hard as he could to avoid finishing at the bottom of the scoreboard, but Andreikin proved to be too resourceful and the game ended in a draw. Aronian's opening backfired and Karjakin comfortably pressured him through the game, in a marathon that lasted nearly seven hours. 3/29/2014 – It's official. With 8.0/13 there is no way anyone in the big pack of 6.5/13 can catch Anand and the Indian player earns his right to fight for the World Championship title against Carlsen later this year. 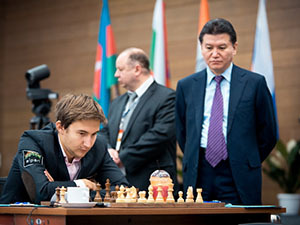 Today's round proved decisive as Karjakin had reasonable chances for a win against Anand, but it was to no avail, while Andreikin took down Aronian. Analysis and report. 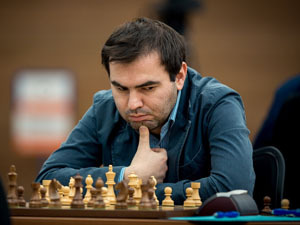 3/27/2014 – Mamedyarov risked against Karjakin, and although it almost backfired neither side gained a full point. Topalov beat Svidler, but is far from the lead. 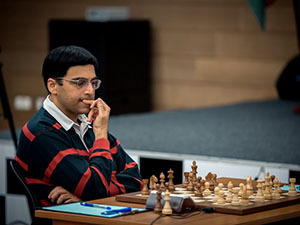 Anand almost cemented his tournament win by playing an exciting attack against Andreikin who saw himself in the defensive early on. However the fireworks were too much for him and the draw was agreed in a winning position. 3/26/2014 – Karjakin was the only player that had realistic winning chances in today's games, as Topalov overpressed against him and got very uncomfortable position. 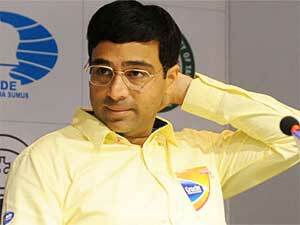 Anand is of course the clear winner of the round as he finishes tournament with two whites in the last three games. The tournament is not yet over, but things are looking good for the Indian. Report of today's round. 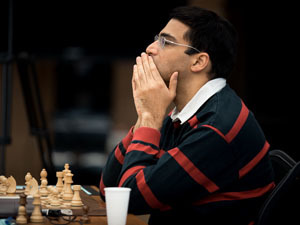 3/25/2014 – Anand inches round by round closer to his rematch with Carlsen. 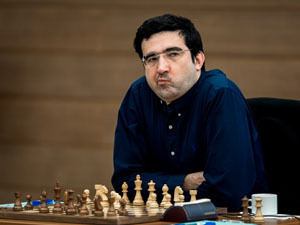 Psychologically he must be pleased about today's results, his opponent tomorrow, Kramnik, blundered badly in a slightly better position against Svidler after playing a great game and he suffered his second loss in a row. 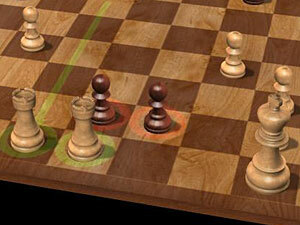 Mamedyarov and Topalov went for a fight with Black, but neither achieved a full point. 3/22/2014 – After the multiple exciting games we have had over the board in Khanty-Mansiysk, the players have finally played a slightly dull round. 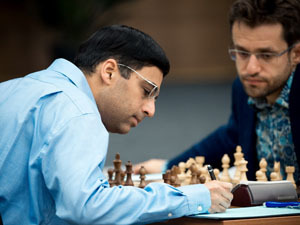 Aronian-Anand was the key match of the day but it was drawn in less than 20 moves. 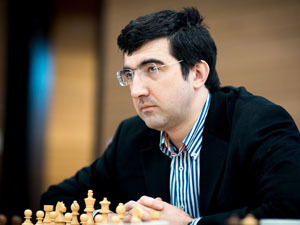 Kramnik couldn't break through Andreikin's position and Topalov-Mamedyarov fizzled to equality. 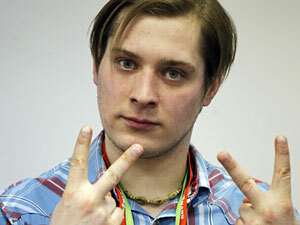 Karjakin did bring down Svidler and now five people have 3.5/8. 3/18/2014 – With fantastic preparation and deep understanding Topalov sacrificed a pawn against Svidler and obtained a very impressive initiative. However as soon as he was away from his home prep he started erring, to the point where Svidler's pair of bishops dominated. 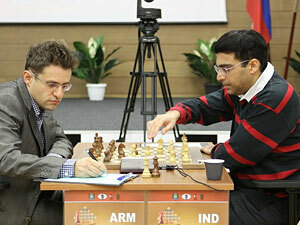 Kramnik-Aronian was a wild draw in which the Russian missed a crucial chance, definitely the game of the day. 3/15/2014 – The Candidates tournament in Khanty-Mansiysk seems to be charged with drama (just 50% draws so far). We have been providing full reports and GM analysis on the evening of the game. We would also like to add some didactic comments by chess trainers and writers, whose views are often helpful for chess fans who are still struggling to understand basic concepts. 3/14/2014 – Anand is forename and a surname of Indian origin, derived from the Sanskrit abstract noun (आनन्द) meaning happiness or bliss. That is pretty much what Indian chess fans felt when, after a long dry spell, the former World Champion won a spectacular game against the favourite of the Candidates. 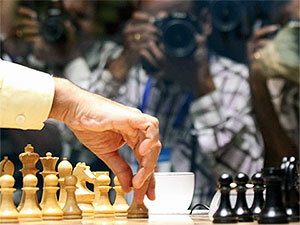 Here is some interesting didactic analysis of the game by two ardent Anand fans. Learn and enjoy. 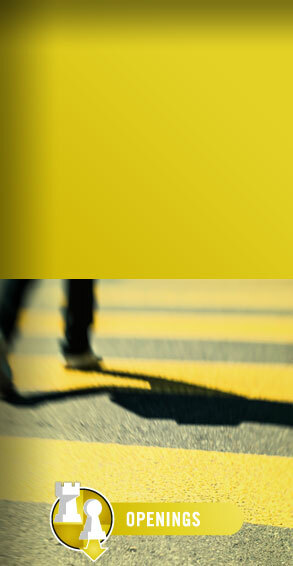 Candidates 2014: what will it bring? 3/13/2014 – In 1948, two years after the untimely demise of the then world champion Alexander Alekhine, the chess world staged a five-player tournament to determine the new World Champion. There were great games played in The Hague and Moscow, but also a series of "imperfections", caused by the interference of the human mind. Will it be the same in Khanty-Mansiysk, Govindaseshan Srikanth asks. 3/12/2014 – The players have arrived and settled down in Khanty-Mansiysk, the technical meeting and the opening ceremony were conducted on Wednesday, the first round begins on Thursday, at 3 p.m. local time (10 a.m. Europe, 5 a.m. New York). The eight players are vying for the challenger slot to challenge reigning champion Magnus Carlsen later this year. Pictures and full tournament details. 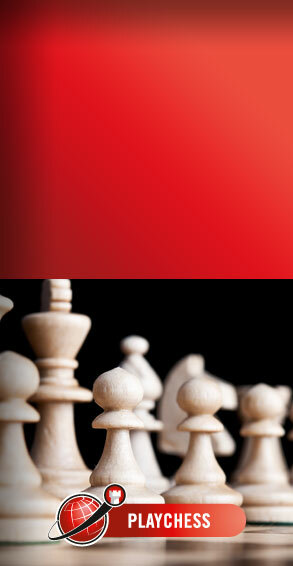 3/7/2014 – The time is approaching, and we are on the threshold of a new Candidates tournament. 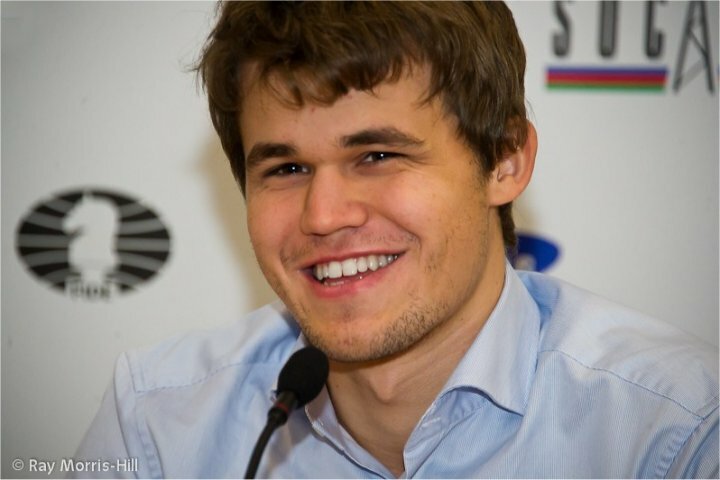 The last one qualified Magnus Carlsen for a shot at the world title, and we know what happened after that. A fresh lineup, with new players and old, promises exciting battles, and we bring you a preview of the players, the tournament, and the schedules for Playchess GM commentary. 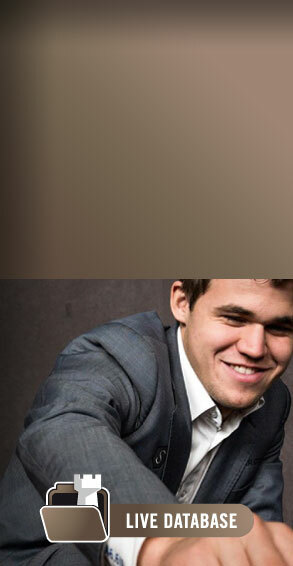 2/12/2014 – This event will determine the challenger to World Champion Magnus Carlsen. FIDE has determined the pairings by random draw in its office in Athens, and the stage is now set for the players to prepare their tournament strategies. 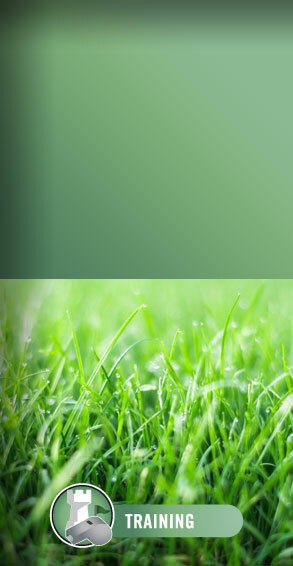 The order of the opponents can influence on how they play depending on style, color and tournament position. 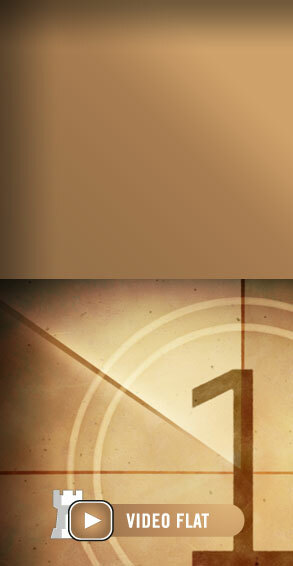 The fight begins in one month. 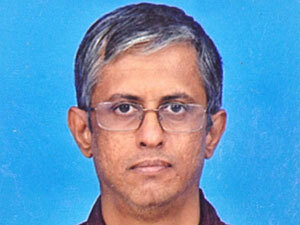 Anand: will he, won't he? He will! 1/21/2014 – We recently informed you that former World Champion Viswanathan Anand appeared to be vacillating on a decision whether to play in the March Candidates Tournament for the next Championship cycle. At least that is the way the media portrayed it. 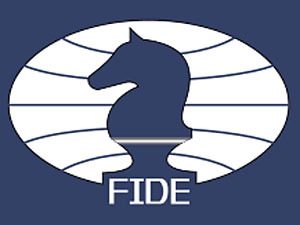 Decision day was January 20, and today FIDE published the official list of participants, which is topped by Anand. 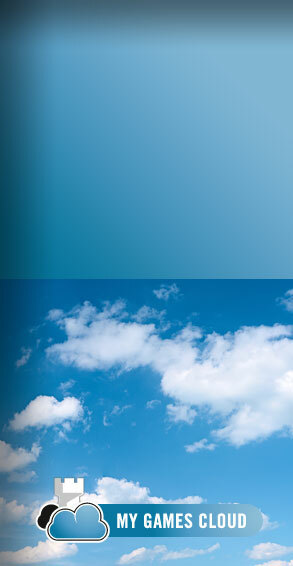 Participants and regulations.